Welcome to the start of a new season. As I am writing this ‘Spring Update’ we have just had a few days of pretty cold weather after quite a stretch of mild and sunny weather. Just when I was getting excited back came the cold and wet!! I can only hope that as we move towards Summer we get some better weather like last year but we have some exciting stuff coming up these next few months so make sure you are getting our monthly e mail newsletter a ‘book early to avoid disappointment’! In this update :- Cruises, AGM 2019, Harbour Dues, Poole Bridges – Bridges Operating Board, Poole Bridge repairs update and inter bridge/basin work, Poole Harbour Commissioners Annual Meeting, Marina Summer Party 2019, Poole Harbour Boat Show and Member Communications. Don’t forget this is the main reason we exist – cruising in company. The point is that you can get the reassurance of going on a cruise, maybe that bit further away than before, with the support and camaraderie of others in the association. We have an exciting programme in prospect which started in Easter with Shepard’s Wharf, then the early May Bank Holiday in Portland, a late May Bank Holiday week around Port Solent and Hamble and finishing with Weymouth for the August Bank Holiday. Cruises were open for booking in February, at a cost of £15, and there are still places available. We are typically limited to 20 or 25 craft or less and so offer cruises on a first come first served basis and those who missed out last year were among the first to book in 2019. Where necessary cruises are running waiting lists and people do drop out so do book if you fancy going on a cruise. This year you can again book and pay on line. If there aren’t any places left you will be placed on the waiting list and refunded if you cannot be accommodated. As I said, in previous year’s, we have been able to place most people so don’t despair. Check out our Cruise Programme 2019 page on the web site for more details. At the AGM I made a plea for some other people to volunteer to be on the committee – or even just help us – with cruising especially, and other efforts. If you think you can help please get in touch. It doesn’t have to be hours of work – every little helps!! As well as the normal business at the AGM we were fortunate enough to have Mike Glanville (now MD at MDL) and Frank Gelder (soon to be the permanent manager at Cobbs Quay). The two main issues for members were electrolysis/anode erosion and boat lifts. I had been speaking to Mike Glanville before the AGM at length about both matters and, I believe, a satisfactory way forward was offered by Mike at the AGM. MDL acknowledge this is happening in the marina and have been working on things but accept they should have told people about it. The cause is, as yet, unclear and may have a link to the better weather last year. However, the future plan has three lines of approach. Members should report it to the marina manager Frank Gelder in the first instance. They will be asked if their boat has been electrically checked and will be offered a test move to another part of the marina. To seek to identify areas where anode erosion is high and speak to boat owners in the vicinity to confirm they have had their boat electrically checked. This guidance will be on what causes electrolysis and how to prevent it. It is being prepared by MDL and we will circulate as soon as we receive it. Meantime ‘self help’ is the order of the day. Be safe and check your anodes regularly. MDL have an underwater camera, which was now available to berth holders to use, free of charge, to check their anodes. It was agreed that this needs to be better and Frank Gelder (new marina manager) is going to produce some ideas and we will meet with him with some other berth holders to discuss how it might work. You may also have noticed that all hoses have been removed from the pontoons, to comply with water regulations, so berth holders would have to provide their own. Harbour dues had risen again this year. A final year of an agreement for an ‘above inflation’ rise. Apparently this was agreed with the Poole Yachting Association and a further meeting of this body with PHC is planned. I am seeking to attend. In order to effectively approach the Harbour Commissioners individual comments would carry more weight. If you would like to comment please get in touch at chairman@cqbha.org. Dave Wilson was the chairman of the Bridges Operating Board – as well as the Leisure Representative. We await action now Dave has retired and expect Frank Gelder to be elected but I imagine not to chair. There is a closed Facebook group as a method of reporting incidents and enquiries. So, if you have any issues, problems or concerns please mail me at chairman@cqbha.org. At this time I believe the faulty pin has been removed for inspection and will need to be replaced. They may have already been but despite now being added as a ‘stakeholder’ by Poole Council we have not heard about progress! I am aware that MDL, together with Sunseeker and the RNLI are in talks with the Council about the general longevity of the Twin Sails Bridge and how reliability and repairs will be as it gets older. I have viewed and commented on (very) early planning applications for reinforcement of the quay on the Hamworthy side of the basin (the area between the bridges) and also for a marina near to the Sydenham’s site. I believe planning applications have been approved but I have heard nothing more. I took the chance to raise this with Mike Glanville in case he could progress anything. Turnover £13.3 m. Up 13%. Ferries account for 32% (used to be 65%). £5m from commercial vessels and 10% (c £1.4m) from the marina operations. 4 calls from cruise ships in 2014. 18 calls last year and this is a key strategy for PHC. Target for 2023 is for 35+ visits from the likes of the Boudicca or Astoria. 4 new cruise companies have been booking. The size limit is about 220 m.
Barfleur was built for the Poole Cherbourg route. She has been updated to latest environmental regulations. Armourique replaced Barfleur during refit. Barfleur has been in the port 25 years. The Pelican is used for freight on the Poole to Bilbao route. Condor Liberation was part of the Condor fastcraft relocation to Poole. PHC would like the freight service that currently operates from Portsmouth. Channel Seaways increased to 3 sailings a week. Poole Quay Boat Haven won marina of the year again and is the most visited marina in the UK. Bono brought his yacht Drumbeat into the marina last year. Poole Harbour Boat Show has grown. It will be on the 7, 8 and 9 June in 2019. There will be a concurrent maritime festival from the 3 to 9 June. There will be various business and schools events. Now the second largest boat show in the country with 35,000 visitors and 150 exhibitors. Pip Hare, an internationally renowned yachtswoman, will open the show and will be based in Poole Harbour in preparation for the Vendee Globe. PHC are involved with Ocean Trust – a marine environmental charity. They will be creating the opportunity for 12 youngsters to go on a sailing event out to sea. PHC are looking for suggestions of people to go. PHC have close working relationships with many other organisations. Safety is the highest priority for PHC. They scored 96% on a recent audit with the British Safety Council. Security also important as Poole is a ferry port. PHC have appointed K9 Security Guarding to deal with port security and there are regular unannounced Government checks to make sure it is up to scratch. There is lots of training including support for Young Enterprise. The Poole Harbour Office is open 24/7/365. Some members recently visited Harbour Control. PHC achieved 99% on an audit in terms of navigation aids. Poole is fully compliant with Port Marine Safety Codes. Other activities include buoyage and pilotage. PHC have increased video surveillance and a davit crane on Fisherman’s Quay. The big investment though was South Quay. It has been in service now for 12 months. It can accommodate bigger vessels. Other smaller UK ports won’t be able to handle these larger boats. It was delivered pretty much on time and on budget at £10m. Poole Port can now offer yacht handing (e.g. for Sunseeker) instead of Southampton. PHC have been Upgrading their website and this will be ready in April. Can access PHC Annual Report online. Richard Ballantine Chief Executive of British Ports Association. 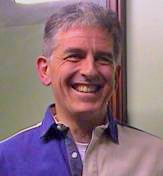 (Jim Stewart was chair of the Association). 95% of UK trade goes through ports. 44% of exports are to the EU. 53% of imports are from the EU. Leaving the EU with no deal means we will be a ‘third country’ and so regulatory checks would mean stopping freight to check customs declarations etc. Checks are carried out at the border – so ports. Bulk handling ports such as Southampton are less likely to be affected. Other terminals are not suited to stopping HGVs to check customs formalities so freight will look for new routes. UK has decided, in the case of a no deal, not to enforce checks in the short term. A later option is to manage them away from the border. The French will be faced with the same issue but they may not be as flexible! The Withdrawal Agreement requires leaving the Single Market and Customs Union and being free to negotiate other deals. Also to maintain a common rule book to handling goods. There would be a dual tariff collection mechanism for goods from a non European country. Concerns are queues at the ports. Also tariffs, loss of EU funding (e.g. for fishing), skills shortages – port agents and customs specialists. Also the impact on the haulage industry e.g permits to drive on the continent. Benefits include a greater focus on ports policy, revocation of EU Port Services Regulation (designed more for Mediterranean ports where there is less regulation). Relaxation of rules and a boost for fishing. Finally ‘freeports’ where customs regulations are different. In any event UK and EU trade will continue. We are still an attractive market. Some ports may need to adapt. Ports, including Poole, are continuing to invest. UK Border Force are having an increase of 300 people. Poole Port works with UK Border Force and Special Branch and work is intelligence led. Small Commercial Craft registration. 100 boats registered. Brian Murphy (Harbour Master) said this was not enough. Letters are going out shortly to remind people to register. Harbour dues up by 9% and revenue is falling. Jim Stewart (Chief Executive) said discussions with yacht clubs agreed a 5 year deal. This should be the last year. There is a meeting with the Poole Yachting Association to discuss the future..
Poole Sailability Trust and are based a Rockley. A trustee spoke about big plans for developments at Rockley. Jim Stewart saw the developments as exciting and offered to talk to the trustee to see if PHC can help. We hope and expect MDL will again be organising a Summer party at the marina. We don’t have any details as yet but CQBHA will be doing everything we can to help make it a success. We will let you know more as soon as we find out. The fourth annual boat show will be based at Poole Quay again this year. Poole Quay will be lined with a selection of stalls selling a wide variety of products including watersports equipment, clothing, RYA training, tenders and RIBs, trailers, outboard engines, marine insurance and more. 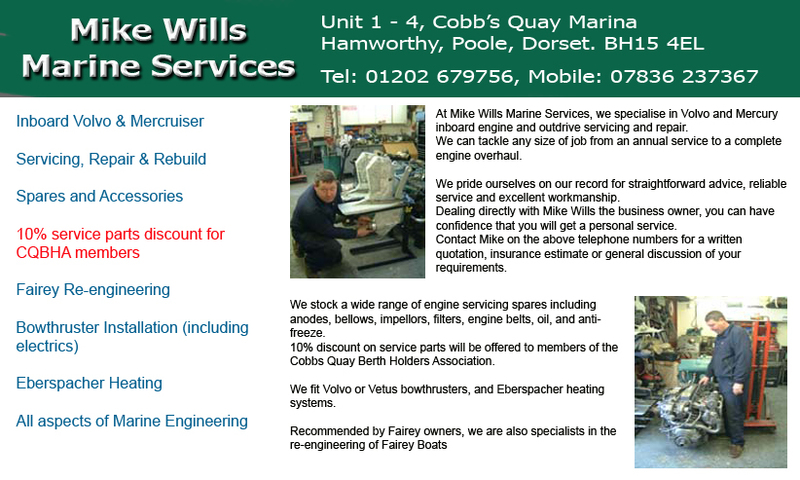 MDL Cobb’s Quay team will again be there so pop along and see them. There will also be fireworks and live entertainment. There is a dedicated web site if you would like to take an advanced look at the planned activities www.pooleharbourboatshow.co.uk. Most important to us is keeping in touch with you as members. We sometimes ask for your opinions – could I ask at least one person to try and reply!! On the pontoons you have your own representative so get to know them as they are your ‘on site’ information and communication person. We’re also on Facebook (Cobbs Quay Bertholders Association click here CQBHA Facebook Link) for general but more importantly ‘instant’ communication such as bridge closures. Please ‘like’ us. We have the web site as a resource for marine services and other information (make sure you mention the web site when you visit them) and, of course, our monthly newsletter. So please, get in touch!! – there is no reason for you not to be up to date!. Are we doing what you want? Finally your committee is keen to be sure we are doing what you want so we need your feedback. Could I ask that you let us know if we are doing a good job, a bad job or if want us to do something differently.